Alexanderplatz is an emblem of the German capital, Berlin. Spacious, beautiful, impressive, Alexanderplatz is probably the most appropriate place where you can start a tour of the remarkable Berlin. The capital is built with modern design and has been built on historical foundations and supports. This is very visible on the Alexanderplatz, which unites around them with modern buildings and modern architecture. Alexanderplatz is located in the central area of Berlin, close to the River Spree and the Berlin Cathedral, also known as, Berliner Dom. The locals, however, often call it just Alex, as the area encompassing the great neighborhood, starts from Molshtraße in the northeast and reaches Schpandauer Strasse and City Hall in the Northwest. Alexanderplatz was always crowded and noisy, right from the Middle Ages when it was the central urban location. Today Alexanderplatz has an intersection of three lines of metro in Berlin, and quite high-speed trains and trams. The original name of the square is Ochsenmarkt. 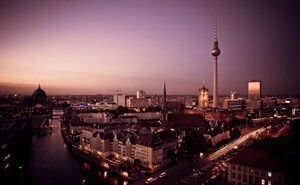 The name, however comes from once in 1805 in Berlin when the Russian King Alexander I went to visit, it is from then that the central location in Berlin was called Alexanderplatz or simply Alex. At the outset of the 19th century Alexanderplatz was one of the busiest places in Berlin and after the reunification of East and West Germany, again it became the center square of the capital. Long been known that Alexanderplatz is one of the least attractive in terms of architecture in Berlin. Consequently, the German capital had been entered in to the contest "retooled". The competition was won by Hans Kohlhoff, who is also one of the architects of the modern Potsdamer Platz. The project of German architect lead to complete reconstruction of the square, as well as repair and reconstruction of the surrounding buildings. Most of the buildings of Alexanderplatz were seriously damaged by the bombing during World War II. After the war, the square became the center of East Berlin and was so quickly turned into something like a showcase of socialist architecture. After the mid-20th century there was almost nothing impressive in Alexanderplatz in terms of architecture. 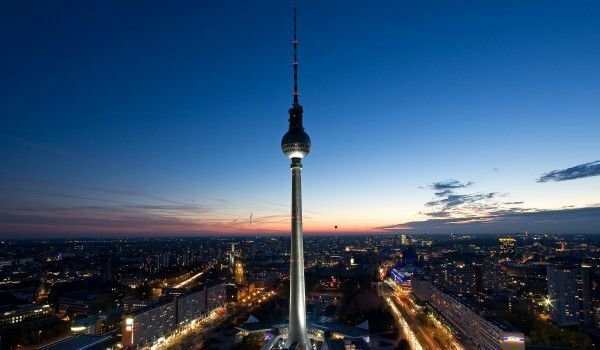 The Television tower in Alexanderplatz is also known as Tele-spargel and is one of the largest structures in Europe. The total length of the foundations to the top of the tower is estimated at 365 metres or 1197 feet. The Television tower in Alexanderplatz was built in 1969 by a joint team between German and Swedish architects. The attractive square tower was built in general of the main body, steel and metal spinning spherical body in the middle and the television antenna. Today visitors can visit the interesting tele cafe in the Spherical part of the tower. In Alexanderplatz you can see two interesting sites, namely the futuristic architecture of the clock, which measures the exact time all over the world and the Fountain of international friendship. Both sites were built in Alexanderplatz somewhere around 1969 when the impressive design of the clock was made by John Erich. In 1997, when the clock was restored, a number of cities that were not originally included in the construction for political reasons, have now been added. These cities are Jerusalem, Saint Petersburg and Cape Town. On top of the clock there is a constructed simplified model of the solar system. The Fountain of International Friends is an oval shape and is 23 meters wide.